Purchase full Rib Animation DVD from Amazon. Downloads available as well. 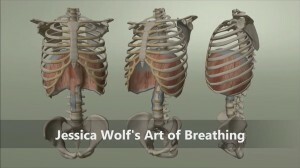 A collection of articles previously published in various journals that explore the applications of Jessica Wolf’s Art of Breathing and the principles of the Alexander Technique. In this series of articles, Jessica Wolf writes about the Art of Breathing the way a physicist might explain the mysteries of the universe in words that the layperson can comprehend. Her expertise has not inured her to the wonderment and brilliance of the respiratory system that is the birthright of every living being. Jessica explains the intrinsic and synergistic nature of breathing coordination in simple yet elegant language. Fully engaging, these articles illuminate the power of our breath in affecting the quality of our lives. The descriptions of case stories are so helpful in understanding how we can use our breath to create positive change. The illustrated vocal exercises are wonderful reminders of lessons learned– and with guidance from professionals like Ms. Wolf, we can understand and access our breathing apparatus to help improve every aspect of our personal and professional lives. A must read! 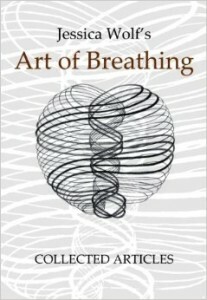 I am very grateful to own this collection of Jessica Wolf’s insights and experiences weaving Alexander Technique and Carl Stough’s Breathing Coordination. She articulates a profoundly simple yet neglected art of a very basic body function that enhances all aspects of life. I am a college-level voice teacher and will make this required reading for all of my students. This book is highly recommended to everyone who breathes on a regular basis. A MUST for anyone who has breathing related issues. Digital Download of 15-minute Audio Lesson: Jessica Wolf’s Art of Breathing Lie Down – Awaken your sensory system and stimulate your breathing rhythms with this calming Alexander-inspired instruction. Email Jessica for purchase. I discuss the principles and applications of Jessica Wolf’s Art of Breathing and offer a short lie-down to listeners in these enlightening and instructional interviews with Robert Rickover.